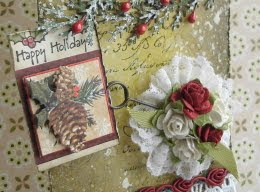 Vada's Blog Stamp Inks and Paper : Happy Holidays “Tim Tag”. In the pass few days, I have seen so many beautiful tags that I just had to give it a try. I had fun doing this tag and can’t wait to try another one. Love it! The rose and lace embellie is beautiful! 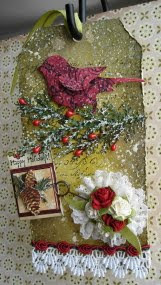 It is brilliant, so beautiful with all the embellishments. This is a beautiful take on the challenge. Love the embellies you used to make it your own style. Gorgeous Vada, I know what you mean I seem to have nothing hes using either! but your tag really is beautiful!